CHARLESTON, SC – January 8, 2019 – South Carolina Ports Authority is pleased to announce new infrastructure supporting agriculture export growth with the opening of C&M Hog Farm’s transload facility, which handles soybeans and other local products bound for overseas markets via Inland Port Dillon. 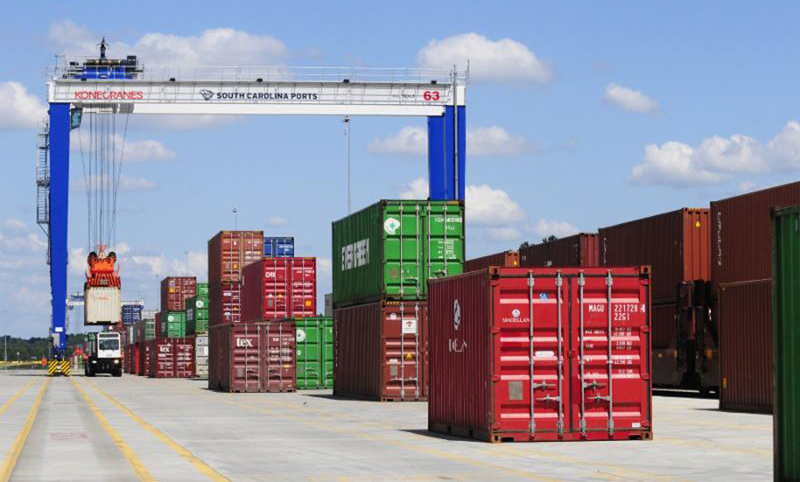 “The expansion of C&M is exciting news that reflects the benefits of Inland Port Dillon for farming and agricultural business across the Carolinas,” said SCPA president and CEO Jim Newsome. “We look forward to continuing to play a strong role in the addition of jobs and economic development activity in the region. Demand for facilities to transload North and South Carolina agriculture products ranging from soybeans to grains, peanuts and animal feeds has increased significantly since the opening of Inland Port Dillon in April 2018. In addition to next-day rail service to and from SCPA’s marine terminals, Inland Port Dillon provides local access to empty containers and the added cost benefit of a round-trip pipeline for loaded containers. Established in 1987, C&M is an independent hog farm, local grain elevator and trucking company located in Latta, South Carolina. South Carolina Ports Authority (SCPA), established by the state’s General Assembly in 1942, owns and operates public seaport and intermodal facilities in Charleston, Dillon, Georgetown and Greer.